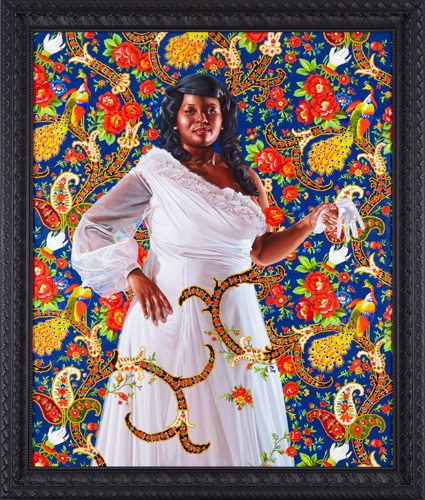 Kehinde Wiley is a portrait painter. Wiley is also arguably one of this century&apos;s most celebrated and important artists to date. With his powerful, realistic images of black people in heroic poses, his work turns centuries of art history on its head. Wiley&apos;s is a name every 20-something, art lover or not, should know. Born in Los Angeles in 1977, the African-American artist works within the boundaries set by the Old European portrait masters like Titian. Wiley&apos;s twist is that he frames the black cultural experience within the pomp, majesty and enormous gilded frames of white art history. By posing ordinary people in the classical poses that serve as art history&apos;s foundation, Wiley&apos;s work subverts the annals of modern and contemporary art and history, reappropriating imagery traditionally painted by white men of white men and inserting these images into modern conversations about race and cultural dominance. Instead of focusing exclusively on the figures, viewers are also forced to see them juxtaposed against bright, patterned, culturally-steeped backdrops filled to the brim with ornate designs that pull inspiration from Baroque filigree, Islamic architectural symbols and West African textile design. Wiley&apos;s enormous works — some span 12 by 25 feet — are stunning. His portraiture is not just a style, it is also a strategic decision. In one particularly celebrated work, Wiley upends the institutional grandeur imposed by Jacques-Louis David&apos;s famous "Bonaparte Crossing the Alps" — removing Napoleon Bonaparte, Wiley replaces him with an anonymous black man in casual, contemporary attire. Wiley&apos;s inspiration and work don&apos;t exist in a vacuum. He openly acknowledges how heavily he&apos;s influenced by the long string of artists and events that came before him with direct shout outs to the greats. "My goal was to be able to paint illusionistically and master the technical aspects, but then to be able to fertilize that with great ideas. I was trained to paint the body by copying the Old Master paintings, so in some weird way this is a return to how I earned my chops — spending a lot of time at museums and staring at white flesh," he says on his site. He also inserts himself into his work, making the paintings both personal and representative: "So much of what I do now is self-portraiture," he writes on his site. "As an undergrad at the Art Institute of San Francisco, I really honed in on the technical aspects of painting and being a masterful painter. And then at Yale it became much more about arguments surrounding identity, gender and sexuality, painting as a political act, questions of post-modernity, etc." "The Virgin Martyr of St. Cecilia," 2008. Kehinde Wiley. Image Credit: Wikimedia Commons. In an interview with the Wall Street Journal, Wiley described his road to success and his place in the larger context of art history: "So much of portraiture has to do with powerful people: powerful white men in powerful poses in big, powerful museums. So what happens when portraiture is about chance? ... Someone who just happens to be trying to get to the subway one day now ends up in the painting that goes to one of the large museums throughout the world!" "Sleep," 2008. Kehinde Wiley. Image Credit: Associated Press. Wiley has the pedigree to line up with other buzzworthy young artists. He is a graduate of the San Francisco Art Institute and Yale&apos;s MFA program; an alum of the highly selective residency at the Studio Museum of Harlem; part of permanent collections at the Metropolitan Museum of Art and the Los Angeles County Museum of Art, among others; and a solo exhibition at the Brooklyn Museum. He has developed a style so distinctly Wiley that his works are instantly recognizable. "Femme Piquee par un Serpent," 2008. Kehinde Wiley. Image Credit: libby rosof, Flickr. While the black cultural experience is an integral, visible and powerful part of American pop culture today, Wiley&apos;s works remain rarefied and rebellious in cavernous museum spaces with stark white walls dominated by white European artists. "Le Roi a la Chasse," 2006. Kehinde Wiley. Image Credit: Wikimedia Commons. Recent series focus on the experiences of people Wiley met while traveling to Jamaica, Israel, India & Sri Lanka, Brazil, Nigeria and more, throwing an irreverent wrench into the Eurocentric vision of the evolution of history. In a recent collaboration with Riccardo Tisci of Givenchy, "Economy of Grace," Wiley depicts black women dressed in extravagant haute couture gowns Tisci designed, illustrated against busy and bright backdrops. The women look like the aristocratic white women memorialized in paintings past. Wiley&apos;s work is distinctly current, melding high-brow and low-brow topics and highlighting celebrity culture in its larger historical context. But it doesn&apos;t feel ephemeral. Years from now his work will stand as a perfect conversation opener for the inherent problems the white Eurocentric art world has with race and diversity. If nothing else, his work will stand alone for its tremendous beauty regardless of message. What will put him in the pantheon of the greats is the irreverence, fearlessness, singular style and hunger — not to mention ability — to change the course of modern art history.